thoughts on ‘hero’ | Kris + Books = Good. *Sometimes*. I know I said I’d make the challenge specific to my blog and not include the reviews I’ve done for Wave; however, technically this is not a book I got through her (see how it came to my intention below). Plus the fact it is so bloody good that it deserves all the pimpage it can get! (I think) Tam mentioned this book to me when we were talking YA a couple of months ago and then in another discussion a so-called friend described it as being ‘FANF*%KINGTASTIC’ and very helpfully provided me the link to a bookstore which not only had the paperback, but also free global shipping to Australia. (Damn you, Sean Kennedy!) Well, who could resist?? Thom Creed is not a typical teenager by any stretch of the imagination. His father, Hal Creed, was one of the greatest superheroes of his generation, but after being blamed for a tragic accident became an outcast. Soon after, Thom’s mother disappeared leaving his father devastated and Thom increasingly determined not to cause any further pain to the person who has been the one constant in his life. Circumstance and, I think, Thom’s natural inclinations make him a loner, who is careful to keep his distance from others and to guard his own secrets. The first of these being that he’s gay and the second his newly discovered super powers and invitation to join the League that ostracised his father; both of which he knows will be of great disappointment and sorrow to Hal Creed. Hero is Thom’s coming of age story. I became very quickly engrossed in Thom’s journey as he struggles with his secrets, the reality of the world of superheroes, the meaning of friendship, the growing feelings he has towards a certain boy, and, in my opinion, most importantly, his relationship with his father. It was the latter that resonated the most with me and truly made this an unforgettable story. Why did I like this aspect so much? I think it was because it was so extraordinarily moving. Many of us can relate to dealing with issues such as acceptance with parents or other family members. In Thom’s and Hal’s case these problems are exacerbated by their personal situations: their inherent wish to be honest and open with each other; their unwillingness to cause hurt and hesitancy to take that first step; the concern and shame both feel about what happened to Hal and consequently to the family; their pride in the Hal’s former life as a superhero; their desire to help people; and, above all else, their love for each other. All of these themes and issues came through so evocatively in Hero and the majority of them the reader is privileged to explore through Thom as he discovers and begins to comprehend his and his father’s past, present and future. Although I was charmed by Thom and found his journey a bitter sweet one, it was the character of Hal who I found particularly poignant. He was tragic and flawed, but strangely heroic. His prejudice towards homosexuals was made clear from the start of the book and this obviously influenced Thom’s secrecy about his sexuality; however, there was no doubt that he loved his son. There were two scenes towards the end of the book that broke my heart. Even typing this I have a tear in my eye so be warned that you may need to keep a hankie handy. 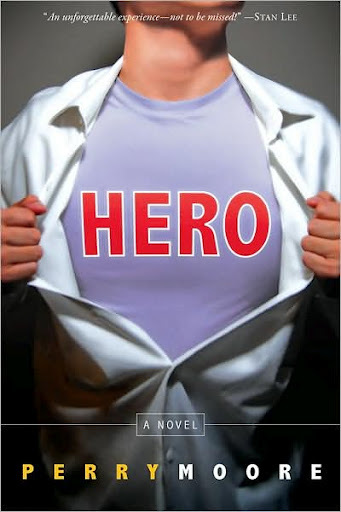 Because some people are sure to want to know ;), Hero is beautifully written from the first person POV with an outstanding, engaging and well crafted cast of characters and an excellent plot. Be sure to set a good length of time aside as it will keep you turning the pages until the very end. Finally, this is not a ‘and the Daddy and Mummy got back together, Daddy regained his place in society, after some minor concerns the Daddy and Mummy accepted their son Thom was gay, Thom found the boy of his dreams, and they all lived happily ever after and saved the world (a number of times), the end’ kind of a story. If that’s what you’re expecting because it’s YA or a superhero story, take your bat and ball and run along home… and may you live the rest of your lives with the niggle that you have missed out on a truly awesome read. Amen. Oh, all right. This is a must read for all those of you who want a ‘FANF*%KINGTASTIC’ story! At the very first opportunity, I will be re-reading it. It was a fabulous experience. PS – Lesley and Tracy I haven’t forgotten your tastings! They will be posted during the coming week. This entry was posted in fantasy, m/m, perry moore, thoughts, ya. Bookmark the permalink. My friend Craig would highly agree with you. It was him who told me about it. I have the book and I stated it in New York but only got to about page 20. I haven’t gotten back to it and now I started the Back Passage. I will though, really, I will, then I’ll make my daughter read it. 🙂 Glad you enjoyed it. You have to thank Craig for me, Tam, for this second hand rec. It was unbeliebably good. I think you will love it too.I passed it on to the Mumma and I’m looking forward to seeing what she thinks about it. IDK I don’t think you’re really excited about this book. I think maybe you could have put more into the review to make us want to buy it, don’tcha think? Not sure I’m sold. FANFUCKINGTASTIC? hmmm….I’ll have to think about it. You think so, Tracy, but I was trying so hard to be objective. You know how important that is to me when it comes to reviews. Ha, your mumma responded on your blog! That’s wonderful!I think it would be a wonderful text to teach in class, but knowing from experience I had parents upset with me for showing ‘Buffy’, you never know how they will respond. Wouldn’t stop me, though, I’d like to think.But then, I am the person who thought it was FANFUCKINGTASTIC. *cough*So glad you liked it, Kris! My pimpage was successful. And once you Book Depos, you never go back. Such a bad influence on my language, Sean. *sigh*I loved “Hero”, Sean! Absolutely adored it. I still get teary thinking about some of the scenes. I’m such a wuss. LOL.Mumma later came over and we sat down and had a chat about “Hero”. She loved Moore’s writing style. We also talked about how her kids may react to it and, although they may have issues about Thom being gay, Mumma believed they would be able to relate to the fact that he was an underdog, he came from a poor socio-economic and single family background (like many of them), etc, etc. Maybe one day. ;)I also showed her the Book Depository site. Needless to say that she went home and went wild. LOL. I come by my obsession with books honestly.Oh, and did you notice that the last of the “Mask” books is out?? O_O I’m checking every few hours so that I can snap it up (and a few others) when it get released via ARe. I’m dying to read it! YA books like this one should be read in classrooms, in a perfect world, because they would maybe help change one bigot’s mind, or make that kid silent about their sexuality feel a little bit better about themselves. But you always have politics and policy to contend with.I know! I think my credit card will be getting a little workout when I next get paid. We’re hopeless, Sean. :(I’m in total agreement with you about these kind of books being studied to try and educate and give confidence to kids. One can only hope. Agree. This book was fan… uhm… tastic. I know this is an older post but I picked the book up a couple of weeks ago and started reading it last night. Really, really good so far and I just want to stop working, go home and read it! But I am confused on one thing – can you email me please? Hi, this is Perry Moore, author of HERO. First I wanted to say thank you, I am so humbled by your review. Next i wanted to ask for some help with two things. 1. Considering the over-four thousand fan letters i've received, I've discovered it's really really hard for young people to ask their local bookstore or librarian for HERO for fear of being outed. Which means YOU have the power to help spread the word online. Mostly on Amazon, but as this site proves, anywhere will help. A good review on Amazon can save hundreds of kids, who are on the ledge, thinking themselves worthless (or worse) and now they believe they can be heroes too! Thank you again for giving me the courage to continue with this series, a book that almost the entire world told me would be impossible to get published. You give me hope! PS–Kris, if you'd like to do an interview, I'd be more than happy. I based the father on my own, a scarred, wounded Vietnam Vet with a Bronze Star. Thank you so much for taking the time to drop by here and, more than anything else, for having the courage to write Hero. You can obviously tell from my review that Hero touched me in many ways; the least of which was relationship between Thom and Hal. At your excellent suggestion, I have added my review to Amazon. I too believe people dealing with such challenges in their lives as sexuality are heroes and deserve our support. With the help from a local author friend, Sean Kennedy, I found one of the few young GLBTQ groups in the city where I live and donated all of the gay teen fiction that I've accumulated in the last 6 – 12 months of reading to them. My hope is that the exploration of issues in these books and such works as Hero will inspire and help them to deal with their own feelings. Thank you very much again for contacting me.